Evidence suggests that the demand for individuals trained in science, technology, engineering and maths (STEM) will continue to rise. A recent review commissioned by No. 10 and the Treasury explored the current skills base in the UK, and possible policy solutions to build STEM capability in the country. Alex Morris, from the Strategy and Growth Directorate in the Department for Business, Innovation and Skills (BIS), explains how BIS and the Department for Education are planning for the future. The challenge of training enough people with science, technology, engineering and maths (STEM) skills has been a concern in Britain for many years. We need graduates, postgraduates and technicians to fill key jobs in STEM-specific roles (as scientists, engineers, technicians, teachers etc. ), and people qualified with these skills to degree level (and at A-level and GCSE) also bring important skills to non-STEM roles: in finance, the Civil Service and other professions, for example. Moreover, a distinction between STEM and non-STEM roles is increasingly blurred: the large computer games industry, for instance, draws extensively on creative and technical skills. So, increasing the numbers of STEM-trained individuals entering the labour market is good news in terms of increasing the UK’s capacity in science, and by bringing increased productivity to other sectors. That’s why in summer 2014 No.10 and the Treasury commissioned the Department for Business, Innovation and Skills (BIS) and the Department for Education (DfE) to pull together a small, joint team to undertake a rapid review of the evidence and potential policy solutions for encouraging greater take-up of STEM at school, further and higher education, and in the workplace. Setting any sort of figure on the scale of desired increase is riddled with difficulty. However, analysis of the various work by IPPR, UKCES and others suggested an appropriate exam question: “What would we need to do to get 1 million people into ‘STEM jobs’ over the next ten years?” This implies around 100,000 a year (an increase in the order of about 30,000 on current levels), which was a reasonable estimate of scale, but also set a stretching ambition. This provided a basis for discussion, and something to test policy proposals against. 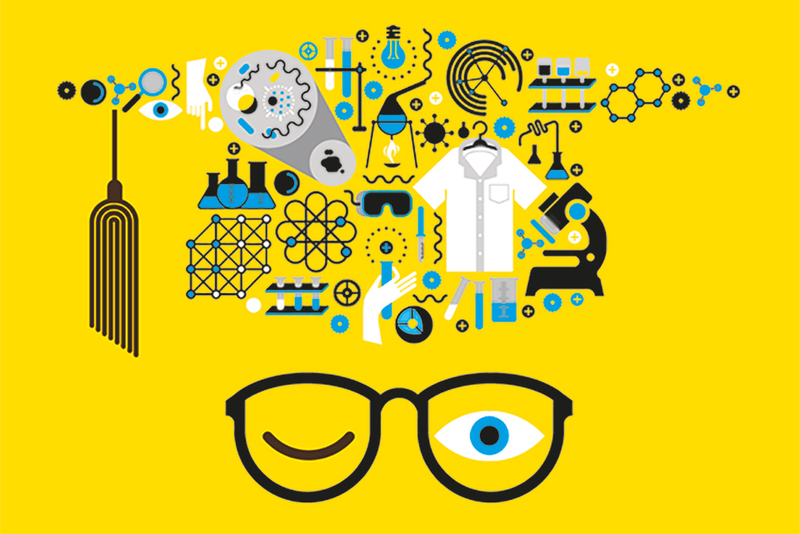 University participation in maths (+55%), physics (+40%) and engineering (+20%) has increased. 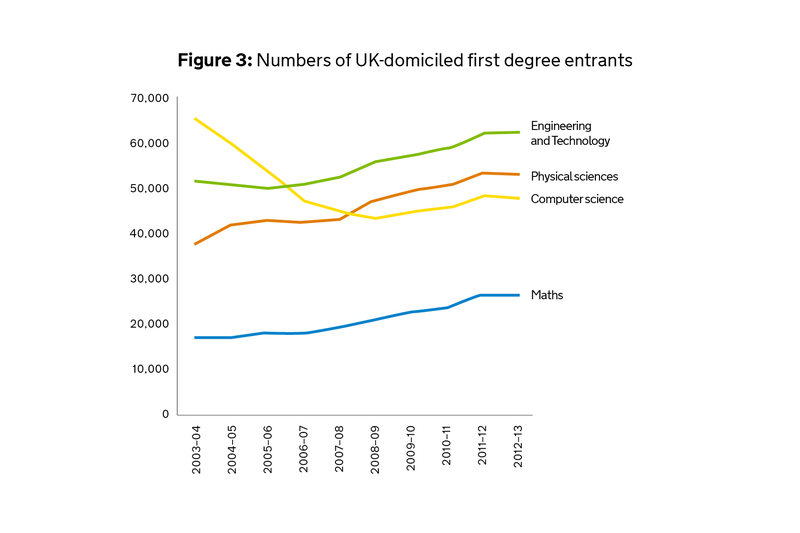 However, a range of recent studies (from UKCES, IPPR and the CBI, amongst others) indicate that a growing economy will need even more individuals trained with STEM skills. The demand for STEM skills in the labour market is most clearly evidenced by the wage premium associated with these skills. Using surveys, and increasingly through matching datasets, we are establishing a much better picture of the work people enter following education, and how much they earn. 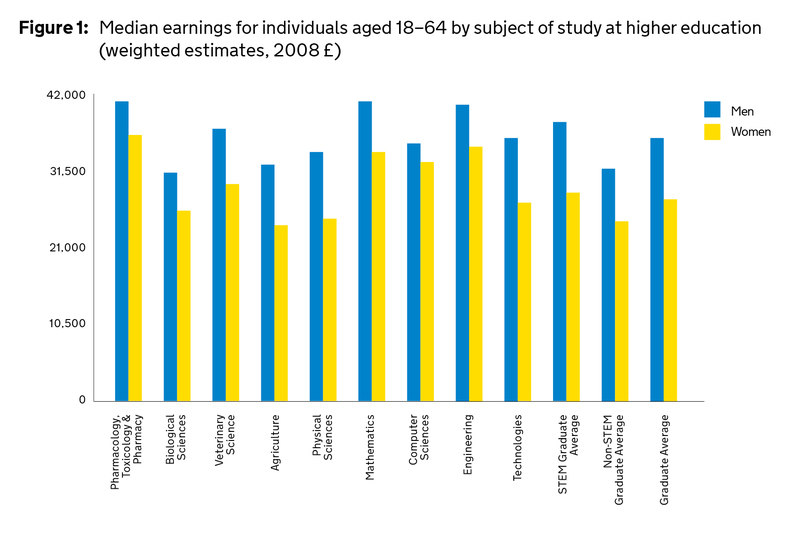 This shows that those with STEM qualifications are found to earn £4–6k more per annum than those with non-STEM qualifications, on top of the existing wage premia associated with each higher level of study. So even with increases over recent year there is still demand from the labour market for greater numbers with STEM skills. And looking below the headline figures there are specific challenges. At school age, a particular issue is that many fewer girls choose to continue studying maths and science. This is not a question of aptitude. Similar numbers of boys and girls get an A*, A or B in physics GCSE. 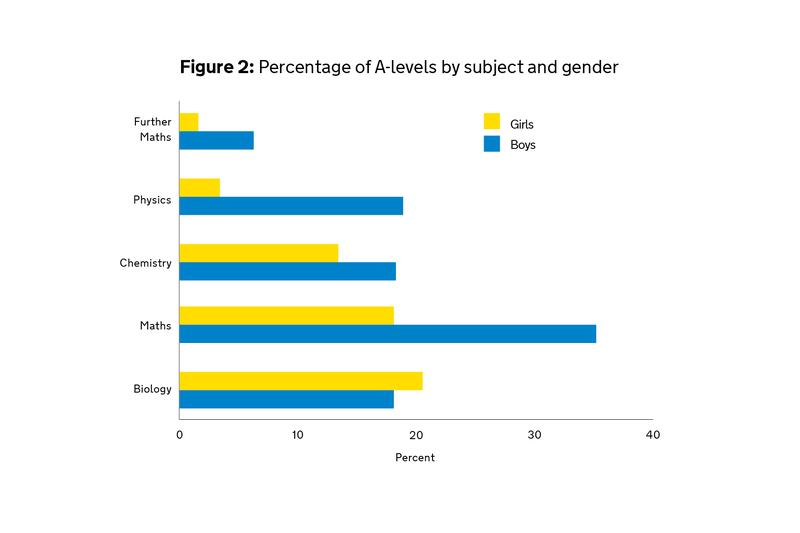 However, whilst 49% of boys with an A* at GCSE go on to choose physics A level, only 19% of girls do. This gender difference is not new, and not unique to the UK. However, a wealth of recent research is helping to explain this, and highlight what actions need to be taken to reverse it. This includes communicating to students how valuable STEM skills are to a wide range of careers. In further education, employers report difficulties recruiting individuals at ‘technician level’, i.e. those with vocational qualifications at a higher level than secondary education. Evidence from the OECD suggests the UK lags behind its peers in providing vocational education at this level. This is partly explained by funding: unlike students undertaking higher education courses, who are eligible for loans to support tuition and maintenance, students studying higher vocational education do not qualify for financial support. This has understandably acted as a disincentive for taking up these types of courses, and therefore colleges and providers from running them. 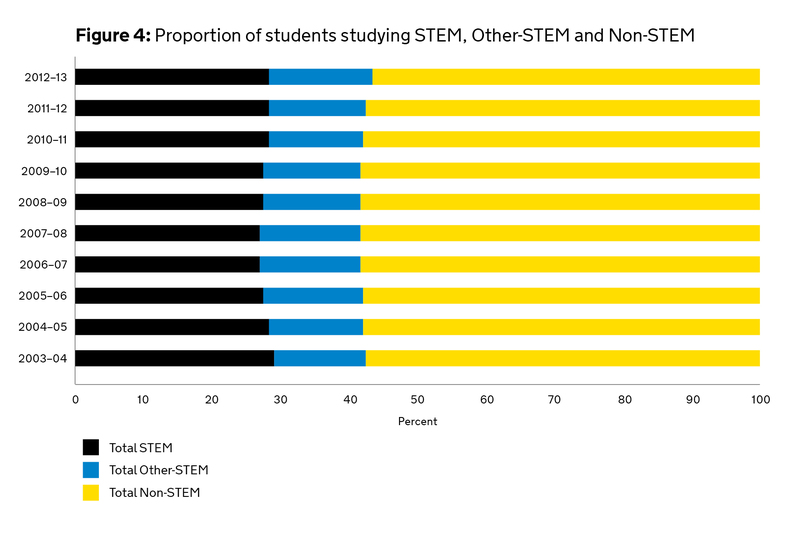 In higher education universities have expanded STEM provision as the numbers studying STEM A-levels have increased, but overall only at the same rate as non-STEM numbers. And, although numbers have increased, we need more engineers and physicists particularly. In addition to the issue of qualified applicants, these shortages are also linked to the fact that STEM subjects cost more to teach than social sciences, arts and humanities. The Higher Education Funding Council for England provides grant funding per STEM student and capital funding on top of tuition fees to meet some of this extra cost. But universities still need to cross-subsidise STEM teaching from arts subjects. Finally, the graduates from some STEM subjects, like Computer Science, have relatively high unemployment rates, despite there being significant demand from employers for computer scientists: the relatively low employment rate may account for a decline in people choosing to study computer sciences since a peak in the early 2000s. The workplace has changed and it is no longer the case that decisions made pre-21 will take individuals through to retirement. This is particularly true for STEM subjects – where fast moving technologies mean that skills need to be regularly updated and it is difficult for individuals to return to a STEM career, for example, after maternity or paternity leave. The review highlighted the levels of participation of female STEM graduates in the workplace as being of particular concern – in 2010 it was estimated that nearly 100,000 female STEM graduates were either unemployed or economically inactive. The review suggested a package of proposals to help tackle the challenges highlighted above. Both the low numbers of girls going on to STEM subjects at A-level and degree level, and the lack of young people choosing vocational pathways highlight the importance of high quality careers advice – including communicating the value of these subjects to a wider range of careers. Last year, the Secretary of State for Education launched the Your Life campaign which is working with a range of employers to do exactly this. High quality teaching in maths, science and the new computing curriculum is also key. However, it can be challenging to recruit to teaching high quality graduates with passion for their subject, given that STEM graduates can command high earnings elsewhere. Following the review, the Prime Minister announced a package of measures which will transform STEM teaching in England by retraining 15,000 existing teachers, and recruiting up to 2,500 additional specialist maths and physics teachers over the next Parliament, on top of existing plans. In vocational education, ministers announced in December a wave of new national colleges in key STEM sectors (Digital, Wind Energy and Advanced Manufacturing) to provide high-level training. Importantly £5m has been allocated for maintenance scholarships that will enable the strongest candidates from across the country to attend national colleges in 2016/17. This trial recognises the need for a package that allows young people to travel to study technical skills at the highest level, but government is keen to work towards introducing maintenance loans in the longer term. Higher apprenticeships are another important area. BIS is working with STEM sector businesses to develop more Higher Apprenticeships in the areas businesses say are a priority. Employers will be able to apply for funding from the Gatsby Foundation, a charitable foundation with a focus on technician level education, to develop new higher apprenticeships in STEM areas. In higher education government is responding to the challenges set out above by providing £185m of additional teaching grant over the next four years for STEM subjects, and £200m of capital funding in 2015-16 to increase capacity to teach STEM. In December, ministers announced that a postgraduate conversion course in engineering will be piloted to enable graduates in other disciplines to become engineers. 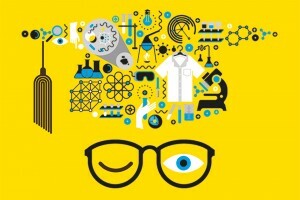 Finally, two independent reviews led by sector experts are looking at how to help graduates to succeed in the workplace: one is examining how to improve outcomes for computer science graduates, and the other is looking more broadly at accreditation arrangements to ensure all degrees contain the right mix of academic and practical learning, and work experience. Finally, in the workplace as a result of the review findings, the government is now setting up a dedicated platform to match STEM trained women graduates to jobs in industry and provide them with advice and support about returning to the workplace. The range of policy proposals which came out of this analysis of STEM skills and are discussed in this article, were announced at the end of 2014 and are now being taken forward by government and partners. A group within BIS will continue to monitor progress in increasing STEM take-up and achievement. This is a challenging issue which has troubled successive governments and there are no easy wins, however, taken together the proposals here should see a significant increase in numbers of STEM students and workers over the next decade.